Former Railway Minister Pawan Kumar Bansal was on Tuesday given a clean chit by the CBI in the Rs 10 crore cash-for-post Railway bribery scandal in which the agency filed charge sheet against his nephew Vijay Singla and suspended Board Member Mahesh Kumar along with eight others for graft and other charges. CBI sources said they have concluded this case and did not find "prosecutable evidence" against Bansal who had to resign as railway minister after alleged involvement of his nephew had surfaced in the bribery scandal. The agency had also grilled Bansal for nearly six hours in connection with the case. No more charge sheet would be filed in this case in which Singla was arrested for allegedly taking Rs 89.68 lakh as part payment of Rs 10 crore promised bribe from Kumar, the agency said. The special CBI court is likely to take cognisance of the charge sheet on Wednesday. The sources, however, added that role of Bansal was still under the scanner in a separate inquiry relating to alleged favours given in promotions and postings in the Ministry during his tenure. Bansal's PA Rahul Bhandari has been named as suspect in the inquiry. 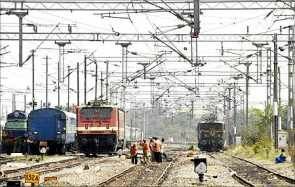 In its charge sheet filed before Special CBI Judge Swarna Kanta Mishra here, CBI has alleged that Singla had demanded Rs 10 crore from Kumar, who was recently elevated as Member (Staff) of Railway Board, for shifting him to his choice post of Member (Electrical), the sources said. It was decided that the money would be given in installments of Rs 2 crore, Rs 3 crore after appointment as Member (Electrical) and the rest after six months, CBI has alleged. CBI alleged the deal was struck through Ajay Garg and Sandeep Goyal who were both acting as middlemen whereas Kumar had entrusted Managing Director of Bangalore based G G Tronics India Pvt Limited, Manjunath for arranging the money and getting it delivered to Singla and Goyal through hawala route. "Initial installment of Rs 2 crore was again decided to be delivered in two installments i.e. Rs 1 crore on May 3, 2013 and another Rs one crore after 3-4 days of first delivery," CBI spokesperson Dharini Mishra said. Manjunath could arrange nearly Rs 90 lakh for the first instalment which was to be paid to Goyal and Singla on May 3, 2013 at the latter's premises in Chandigarh on behalf of Kumar, the sources said. CBI, which was keeping a tab on the activities of the accused through their phone surveillance, got to know of the plan and caught the duo red-handed with the money. The agency has charged 10 persons for alleged violation of the Prevention of Corruption Act. Besides Kumar, Singla, Manjunath, Goyal and Garg, the other alleged accused are Rahul Yadav, Samir Sandhir, Sushil Daga, C V Venugopal and M V Murali Krishan. Barring Murali and Venugopal, CBI has arrested all the remaining eight accused named in the charge sheet. Filing of the charge sheet has dimmed the hope of arrested accused to be released soon on bail. The sources said in cases of corruption, agency had to file its charge sheet within 60 days of arrest or else the accused are released on bail. The limit was expiring today as the agency had registered the case on May 3 and in a surprise search operation had arrested Kumar, Singla and others.